We have a Quanta Q-Plus C, the only 3 true wave length Q-switched system available in the world. It has the capabilities to remove full color, administering more power, with less adverse reaction. Antiquated circular light has unevenly distributed energy and hot spots, which has the tendency to break open the skin, severely blister the tissue which leads to scarring. Quanta’s square beam distributes the energy evenly in the tissue, leaving no hot spots and twice the energy to break up your tattoo. With the latest in technology and technique, our facility is able to provide less than a 5% chance of scarring to the treated areas. Is it easier to remove tattoos from certain parts of the body than others? It is easier to remove tattoos from the parts of your body that have more circulation. For example, it would be easier to remove something on the belly, neck, or chest compared to a finger or toe. How do you determine how my skin will react with the laser? Each of our treatments begins with a test spot so we can determine how your skin reacts to UV light. Yes. Individuals younger than 18 can be treated with parental consent. How long is it in between treatments? Initially we start the process spacing treatments 4 weeks apart, then gradually move treatments out to 6 weeks, and then 8 weeks close to the very end of the process. It’s more effective to give your body time to digest the ink, therefore giving you better results. What is the healing process after getting treated with laser tattoo removal technology? With normal tattoo removal treatments, you can expect to be in bandages 1-3 weeks from the time of your treatments. With the new laser technology available at our clinic, you can expect to be in bandages for only about 3 hours. After getting treated, you can expect to see swelling and redness for about 24-72 hours following the procedure. The treated area will feel like a sunburn. How long is the tattoo removal process? A tattoo removal treatment is typically a very quick process completed in just a few minutes. A consultation and treatment included doesn’t exceed 30 minutes. This depends on your tattoo – its size, color, and the depth of penetration of the ink among other factors. An amateur tattoo may need 2-5 treatments. A professional multi-colored design might need 5-12 or more treatments. One purpose of our free consultation is to discuss how many treatments are necessary to remove your unique tattoo. It can sting a little and feels like having an elastic band snapped against your skin. We use the same, state of the art Cooling System used in the most prestigious plastic surgery centers. It applies chilled air to the treatment site to minimize your discomfort. Who can benefit from laser tattoo removal? What about patients with previously treated tattoos? 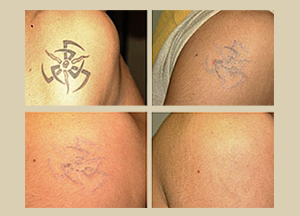 Everyone can benefit from laser tattoo removal, regardless of whether your tattoo was previously treated. We will treat your tattoo properly, using top-of-the-line laser tattoo removal technology. 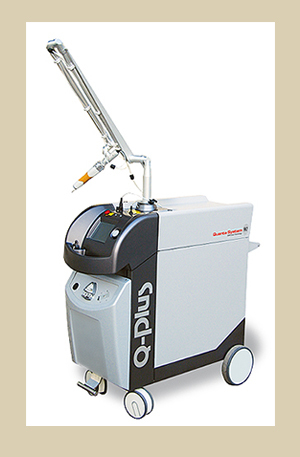 Currently, we use a Quanta Q-Plus C, the only 3 true wavelength Q-switched tattoo removal system available in the world. We specialize in getting it right the first time and even repairing tattoo removal work done by other clinics with older technology that may not be as effective as some of the newer lasers we use. Can most tattoos be treated? The great majority of tattoos, whether professional or amateur, respond to our laser treatments. Some pigments, especially green, orange and yellow are more difficult than other colors to eradicate, but even they usually respond following a prolonged course of treatments. What separates us from most laser tattoo removal clinics is that our technology allows us to remove a full spectrum of colors where other clinics have only the technology to remove certain colors. No. You will need to provide us with your health history, type of tattoo, age of tattoo, and one of our laser tattoo removal specialists (LTRS) and certified laser technicians (CLT) will explain the procedure your options for tattoo removal and answer any questions along with providing price per treatment.